The U.S. Supreme Court on Monday agreed to hear a case involving Fred Phelps and his Topeka congregation, whose protests at military funerals have angered families across the country. 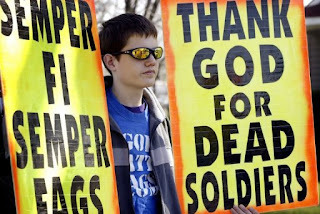 The court said it would consider an appeal from the father of a slain Marine who hopes to reinstate a $5 million verdict against the Topeka-based Westboro Baptist Church. Albert Snyder of York, Pa., successfully sued the church in a Maryland federal court in 2007 arguing its funeral protest was an invasion of privacy that caused his family emotional distress. But last fall an appeals court reversed the $5 million verdict, ruling the church’s protests were protected by the First Amendment. The Supreme Court will hear Snyder’s appeal this fall. Westboro, an unaffiliated church with fewer than 100 members, went from local curiosity to national notoriety after it began protesting military funerals. Church members believe the deaths of military personnel — as well as tsunamis, Hurricane Katrina and the 2006 Amish school shooting — are God’s punishment for the tolerance of homosexuality. It’s a theology summed up on their hand-painted protest signs: Thank God for 9/11; America is Doomed; and Thank God for Dead Troops. Shirley Phelps-Roper, a church leader and daughter of Westboro founder Fred Phelps, said her sister Margie Phelps is likely to argue the church’s case before the Supreme Court. Shirley Phelps-Roper and Margie Phelps are licensed attorneys. Phelps-Roper said it’s God’s will that the church gets to appear before the nation’s highest court. Regardless of the ruling, she said it’s a “win-win” for the publicity-hungry church. For constitutional law scholars, the case promises fireworks. Funeral protests pose unique legal questions, and the ruling could have implications for the many state laws passed to curb Westboro’s actions, said Richard Levy, a professor of constitutional law at the University of Kansas. The case also may not fall along the court’s traditional fault lines, Levy predicted. “I don’t know what the conservative or liberal position is on a case like this,” he said. Snyder said he had never heard of Westboro Baptist Church before it announced plans to protest his son’s funeral in Westminster, Md. The day of the funeral, Snyder was forced to enter the church’s service entrance to avoid protesters. Not knowing what to expect from the Kansas congregation, local police set up a mobile command post and deployed a SWAT team, Snyder recalled. Phelps-Roper, however, isn’t remorseful. Her church has protested similar funerals across the country for years. Just last week, she was in Washington picketing a memorial service for the late U.S. Rep. John Murtha and protesting in front of the Supreme Court. Westboro’s adherents argue that the First Amendment is designed to protect speech the majority may not want to hear. But Phelps-Roper is ambivalent, noting that man’s law won’t matter much when America meets divine wrath.